Region: This Caterpillar is found in most of the United States and southern Canada. 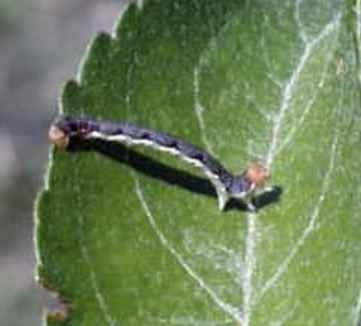 Cankerworms hatch from eggs that are laid in late fall or early spring by wingless moths. Hibernation occurs in the soil. The moths appear in early spring. Physical Description: This 3/4 inch long caterpillar is light green to dark brown with white lines down its back, and has three pairs of prolegs. The adult moth is light brown to gray with translucent wings that span 1 inch. The brownish purple eggs are laid in masses under the bark of trees. Feeding characteristics: This pest attacks apple plants by feeding on foliage, often dangling from silk threads. They tend to appear in cycles of two to three years. February to catch the female moth climbing up to lay its eggs. Tanglefoot is a good compound or even molasses or pine tar. The Potter Wasp, Trichogramma Wasp, and Spined Soldier Beetle are a predators of this caterpillar. For serious infestations, apply Bacillus thuringiensis.